So...Leinster began this season with five wins out of six, and most teams would be happy enough with that. But for fans [myself included] there was a lot of 'Happy with the win, but if we [insert failing here] in Europe we'll pay the price'. Then we only went and reeled off two maximum point Champions Cup victories in succession. Go figure. But it's not like those failings didn't exist, and many of them feature in this particular selection. Worried about a brittle defensive channel down the middle? The Reid/O'Loughlin axis has often been the culprit, and in Belfast there will be Adam Byrne on the wing who also has issues in that department. Worried about wayward lineout darts? James Tracy chucked a couple in Glasgow and more besides before, yet he starts tomorrow. I'm leading with those negatives not because I think they're match-defining, but they are definitely worth noting. Now that's out of the way, time to look at the matchday 23 through another lens...the amount of returning talent to the squad. Naturally the name Sean O'Brien leaps off the page, especially when it has the word 'captain' alongside it. I think it's a role he can do well, though a bit like Peter O'Mahony his personality might mean it takes a while to fully grow into it. 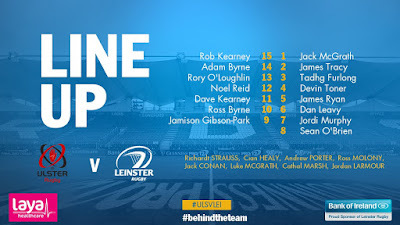 He'll certainly do well alongside Dan Leavy and Jordi Murphy, two more who have had long-term spells on the sideline. Another high profile returnee is Rob Kearney. He's had a lot of false dawns fitness-wise recently and in the meantime Joey Carbery has become a regular in that 15 jumper, blue and arguably he's not far off the green one. I'm not sure if it will be enough for Rob to simply get through this 80 minutes unscathed - we'll need to see some kind of stand-out play and running back kicks from the opposition is where I'll be looking the most. Then we have the very welcome return of Richardt Strauss. Whether we need an extra back rower or not, he does much of the work of one around the breakdown and we could be looking for his skill set in the closing stages when turnovers could literally decide the game. Last week the bookies couldn't tell between us and Glasgow yet shaded it to the home side by a point. This time they see absolutely nothing in it. I see what they mean, though having said that, a victory by a decent margin for either team is also possible. If that fiery Ulster backline gets grabs the initiative in the early stages it could be a good day for the home fans. But if the Leinster pack minds the ball when it matters as they have done of late, it will be those heading back down the M1 smiling. 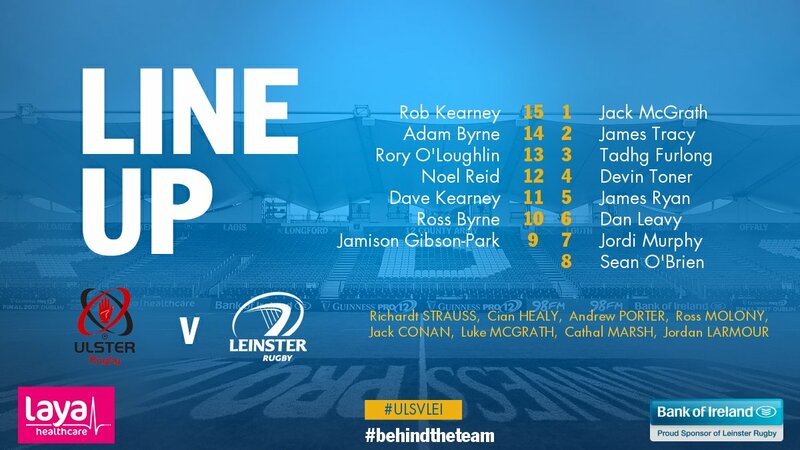 Gun to my head I reckon the Ulstermen are missing too many key players in their squad, but if we do finish on top it shouldn't be by more than a few points. (9-15): Aaron Cairns, Christian Lealiifano, Jacob Stockdale, Stuart McCloskey, Luke Marshall, Tommy Bowe, Charles Piutau. Replacements (16-23): Rob Herring, Andy Warwick, Ross Kane, Kieran Treadwell, Robbie Diack, Jonny Stewart, Peter Nelson, Louis Ludik.